The Pinners’ and Wiresellers’ Book covers the accounts of the medieval craft of the Pinners between 1462 and 1511, prior to and following their meeger with the Wiremongers to form the Wiresellers Company in 1497. It is a most unusual volume since there are no other administrative records surviving from such a lowly craft in medieval London. It reveals how a small craft (some thirty members) struggled to maintain a hall, control working practices, license alien craftsmen and secure prayers for themselves and their families at the house of the Carmelite Friars in Fleet Street and St James’s hospital in Westminster. On occasion the Pinners joined forces with other crafts, such as the Girdlers in searching in the City to confiscate defective goods, or with the Cutlers to petition Parliament against the import of manufactured goods from abroad. However, in spite of their brave efforts, to which this slim volume bears witness, the Pinners were not able to remain an independent craft. They joined the Wiresellers in 1497, and this amalgamated craft itself went on to merge with the Girdlers in the sixteenth century. This volume has never been in print before and has hitherto only rarely been used by historians. The London Record Society edition is enhanced by the inclusion of the wills of some thirty medieval pinners and wiresellers, most of which were registered in the Court of the Bishop of London’s Commissary (whose records are now in Guildhall Library). Barbara Megson read history at Girton College, Cambridge, and spent much of her professional life in the field of Education as a teacher, administrator and as H.M. Inspector of Schools. 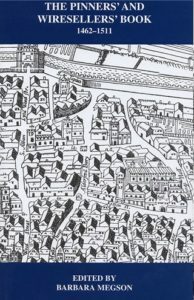 More recenlty she has focused her attention on the medieval city of London and in 1993 published Such Goodly Company: A Glimpse of the Life of Bowyers of London 1300-1600. She is currently working on a history of the Farriers of London.